Time marches on and history sometimes fades into vague memory and then is forgotten. If I asked anyone in my classes if they know who Danny Kaye was, my guess is that a couple of hands would go in the air and the other twenty-five would look at me blankly. This is no fault of their own, there are so many good films to catch up on, and if you are a fan of the Golden age of Hollywood, you probably want to absorb some film noir, or catch up on classic westerns that you have missed. Heck, maybe you would even want to see some of the socially relevant classics of that time period; films like “On the Waterfront”, “Gentleman’s Agreement”, or “The Best Years of our Lives”. Who could fault you with so many wonderful choices? I don’t ever want this continuing column to be about scolding people for the films they have not yet found. 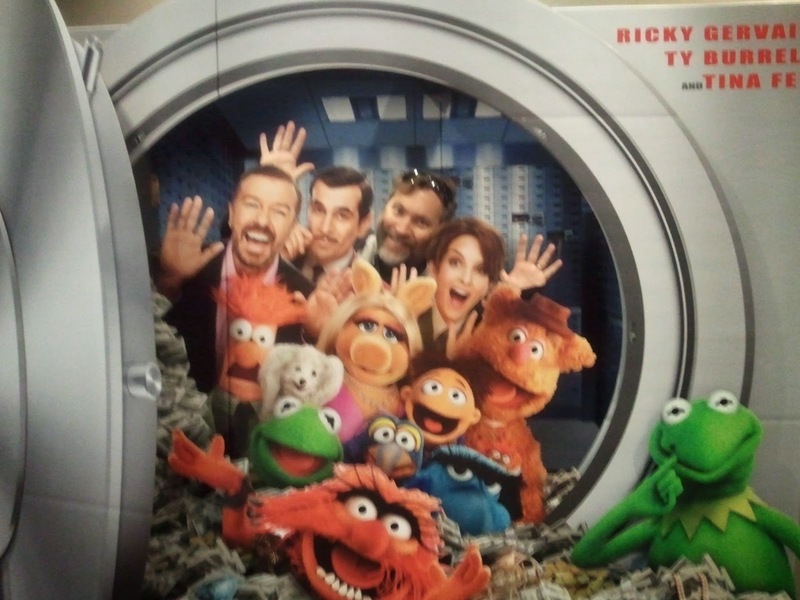 My purpose is always to bring attention to a movie that I want others to share and enjoy. While Danny Kaye starred in dozens of movies and did television up till his death in 1987, it is this movie that makes me most love him. It is time for me to share the love. “The Court Jester” is a twist on the “Robin Hood” story. A band of outlaws has formed a secret clan to protect the infant that is the true King of England. A group of not so noble Noblemen, has helped a usurper gain the crown and now they seek the last surviving blood heir to end that line. 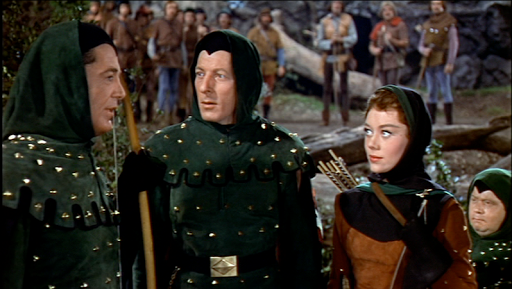 To make the comparison even more complete, the lead conspirator behind the false King is Sir Ravenhurst , played by Basil Rathbone in a part that mirrors his role in “The Adventures of Robin Hood”. The leader of the outlaw group, sworn to protect the true King is known as The Black Fox. Among the followers of the Fox is Hubert Hawkins, a performer in a traveling carnival who dreams of d erring do and the beautiful maid Jean. 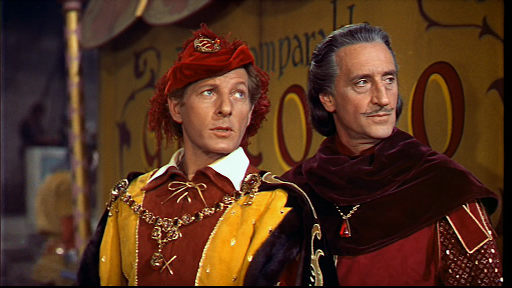 Danny Kaye is Hawkins, consigned to a role as laundryman to the Fox and nursemaid to the infant king. He and Jean seize an opportunity to place themselves inside the court to gain access to the castle on behalf of the Fox. 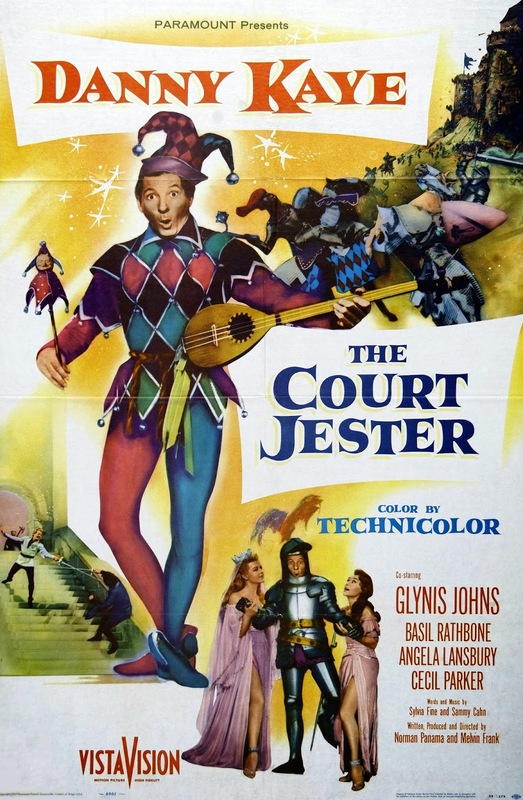 The means for doing so and the complications that follow make “The Court Jester” a lively entertainment filled with hummable songs, repeatable dialogue and beautiful art direction. It is also comically loaded for bear, with enough ammunition to take down a grizzly. There are corny puns, slapstick physical bits and sly parody of the traditional swashbuckling forms. All of this delivered by one of the most unique screen entertainers of all time. 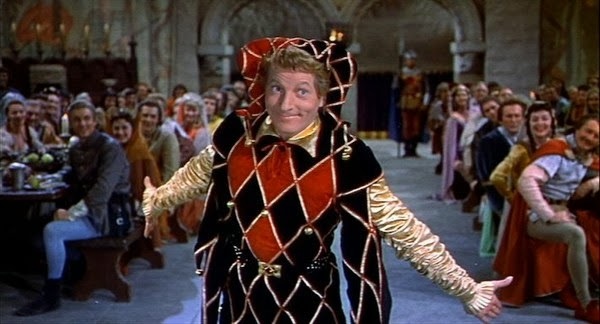 Danny Kaye was a clown, but a suave clown and this is his circus. 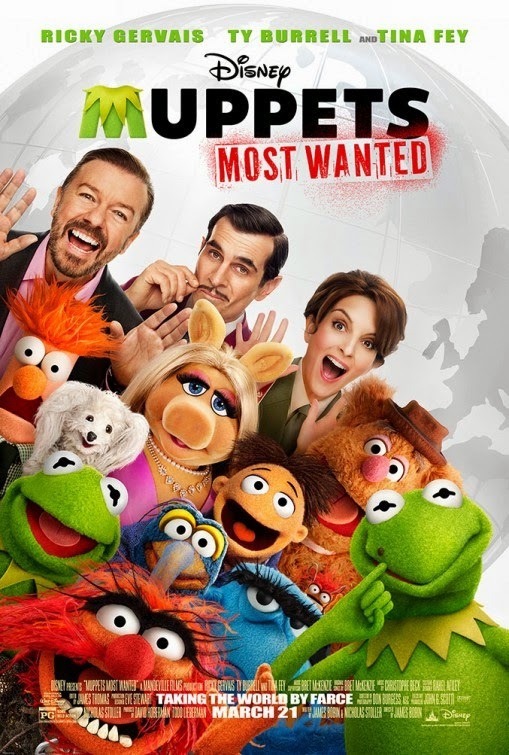 Much of the humor derives from the fact that this is a mistaken identity plot. To start, Hawkins assumes the part of Giacomo, a jester imported from Italy to entertain the new Royal family. John Carradine, the patriarch of the acting family, appears briefly as the jester that the outlaws hope to replace. Since no one at the court knows Giacomo by sight, they think they have the perfect cover. There of course is a twist on the plot because the jester is also an assassin, brought in to quell rival nobles in palace intrigue. So the hero thinks he is playing a simple entertainer and Ravenhurst thinks the fake jester is his hired killer. The confusion over character goes even more crazy when the Princess, seeking escape from the plans of her father the usurper, chooses the jester as a love interest. It involves hypnosis and subterfuge from the chief lady in waiting Griselda, played by Mildred Natwick, standing in for Una O’Conner. Rathbone is at his oily best, planning assasinations, plotting to thwart an alliance with a powerful baron, and in the end showing one more time that he was Hollywood’s premier fencer. He plays the straight man to Kaye’s clown so well that you might think they had worked vaudeville or Broadway together years before. Although his lines are never the punch lines, he manages to fit in with the clever word play and come off as a really sinister character at the same time. I suppose like Bond aficionados, who prefer the actor they first discovered 007 with, Baker Street Irregulars will identify with the Sherlock Holmes that helped them discover the great detective. For me, Rathbone will always be the perfect Sherlock. He was the quintessential villain for generations of fans of Errol Flynn and other swashbuckling stars of the era. His casting here is a sly nod at the familiarity with which he played those parts. 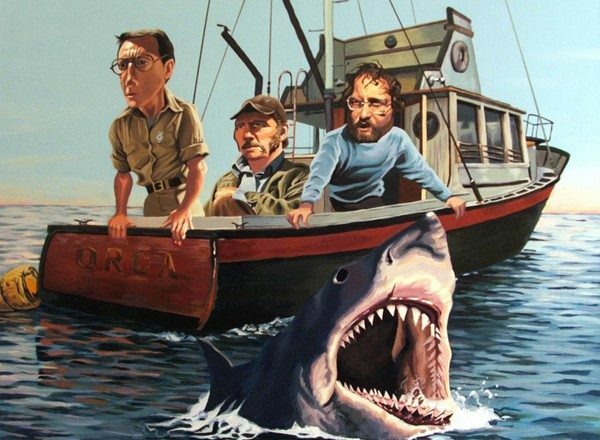 the movie. He has to go from dashing devil may care lover to confused spy, to heroic outlaw all in the blink of a moment. 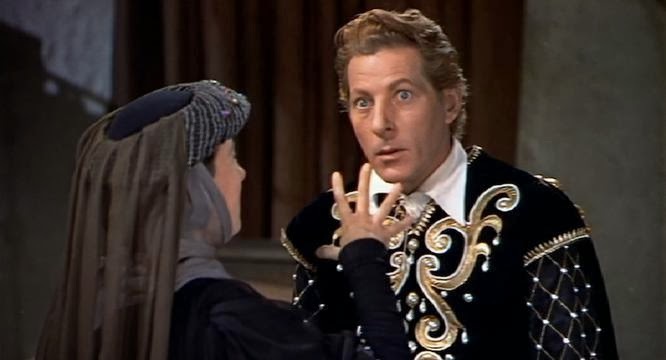 That is Danny Kaye’s gift to film, his ability to instantly convey an emotion or a state of mind in an instance. The only parallel I can think of among contemporary performers is Robin Williams in one of his milder comic riffs. In a few weeks, we will see Ben Stiller tackle the role of “Walter Mitty” a character from a short story, who visualized and led a vivid imaginary life. Danny Kaye played the part in a musical comedy back in 1947. I doubt that Stiller will be expected to be quite as elastic as the Danny Kaye version of the character, I also doubt that he would be willing to try. Kaye’s gift feels truly unique. It may be imitated but never duplicated. Film styles change and many movie lovers of today may not have the patience for the way narratives unfolded in traditional Hollywood fare. I also know that despite the frequent love of films adapted from stage musicals, many people can’t relate to this form of musical story telling. I find it magical and I want others to take a chance and give the movie an opportunity to charm you. Pay close attention to the lyrics, there are delightful puns and word play in most every line. The opening title credits are funny. I mean the text and the font, not just the picture and the words. I have been keeping a list of all the films I watched this year and this one appears three times already, and it was not in theaters. It’s up to you to decide to enhance your life and seek out one of the wonderful comic geniuses of the twentieth century. Don’t let the fact that this actor and his style of comedy are not en vogue prevent you from experiencing one of the best comedies of the 1950s and a terrific musical to boot. All you have to do is choose. Now will it be the Vessel With the Pestle or the Flagon with the Dragon? 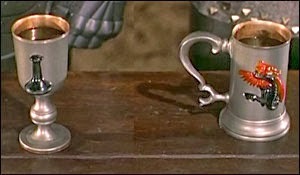 I know which I will choose, no wait wasn’t there a Chalice from the Palace? Oh Oh.